And a key element in any pet bed. If you have no idea what bed to buy for your pet - whether dog or cat - may find a good solution in this bed so special. It is a pet bed that emulates the folding beds for us humans. This is a bed when closed, is hidden in an elegant and colorful wood furniture. This pet bed will allow you to keep it closed when the dog or cat is not sleeping, and thus prevent their hair can be distributed over the whole house, or even take to save space in the environment where you placed. Another advantage of this pet bed? That is not at odds with the classical decor of your home. At first glance, seem like a small wooden cabinet whose top surface can also be used to place decorative objects such as lamps or candles. 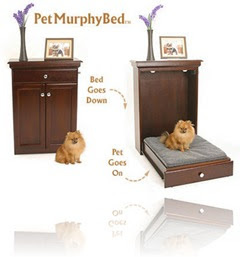 This unique pet bed called PetMurphyBed and costs about $ 250. It is available in color or in black oak, which is more modern.